You are lying on your bed, and suddenly your phone rang, your best friends are coming over to visit you. But there is a problem your house is a mess. We are all put in this situation sometimes, so acting quickly and being creative helps a lot. First stand up from your bed, gear up and start cleaning and organizing the place. You can’t expect to do a detailed clean like in your designated clean-up days, but a faster more convenient one will have to do the trick. First if needed to some household clearance, remove some items and furniture you think is just too much. This is one of the fastest ways to start cleaning. Open the windows let fresh air come and chase the cigarettes or food odor. If your curtains are dirty or stained just remove them, or if you have spear ones put them on. You have no time for washing them. If the windows are dirty, just lower the blinds and you will be ok. Spray air fresheners a good tip is to spray it on the light bulb, and as it heats, it will spread it around the room. Another idea is to turn on the air condition and spray you freshener in, so as the air is circling fresh smell will be transported around the room. Get your vacuum cleaner it’s the most crucial arsenal for cleaning. 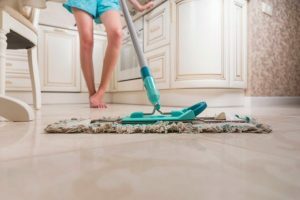 Start vacuuming the floor, if dust is present today vacuums have many adapters just circle between them, and you will do two things with one activity. These things are vacuuming the floor, followed by dust vacuuming from desks, tables, wall sockets, and even some home decorations. This can do to all rooms, so not just your guest room. Your friends might ask you to visit the kitchen, living room or even your bedroom to check that beautiful king size bed you bragged a bought. Don’t forget to check your bathroom or bathrooms, do a quick vacuuming and clean the toilet and sink if you have a bathtub or a shower just close the shower curtains. If the floor needs too much cleaning to take some carpet and use it. No one will remove and see what is under it. Take one big garbage bag and start tiding throw everything inside, clean your garbage bins and other excess things you think. The first thing your guests see is the entryway, so you door knobs must be wiped down. Take your mattresses, not forget the welcoming one shake them off or vacuum them. Glass needs to be polished and any shoes and clothes removed. Check if the lights are okay, if not change them you want to have functioning bulbs and not sit in the dark. You should use some decorations for a more welcoming entryway, so it looks better. For the end play some chilling music on your device, do another quick inspection and check if any fishing touches are needed. Wait for the bell to ring and welcome, visitors.